There are many factors that can affect the way that your vehicle performs. The temperature outside can mess with your vehicle and it can stop your vehicle's battery from working how it is meant to work. It is important for you to know that this can happen and for you to do what you can to look out for your vehicle. 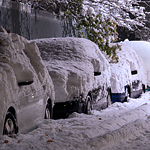 Extremely cold temperatures can reduce the capacity of a battery. This can stop the battery from working how it is meant to work. When your vehicle sits in cold temperatures for a long period of time, the battery may stop working, altogether. Extremely warm temperatures can increase the capacity of a battery. High heat can also cause a battery in a vehicle to lose some of its life. You may find that your batteries do not last as long when the weather is hot and your vehicle is stored in high temperatures.